On May 30, 2018, Secretary of Defense James Mattis announced a momentous shift in American global strategic policy. From now on, he decreed, the U.S. Pacific Command. which oversees all U.S. military forces in Asia, will be called the Indo-Pacific Command. The name change, Mattis explained, reflects “the increasing connectivity between the Indian and Pacific Oceans,” as well as Washington’s determination to remain the dominant power in both. If, until now, you hadn’t read about Mattis’s decision anywhere, I’m not surprised since the media gave it virtually no attention — less certainly than would have been accorded the least significant tweet Donald Trump ever dispatched. What coverage it did receive treated the name change as no more than a passing “symbolic” gesture, a Pentagon ploy to encourage India to join Japan, Australia, and other U.S. allies in America’s Pacific alliance system. “In Symbolic Nod to India, U.S. Pacific Command Changes Name” was the headline of a Reuters story on the subject and, to the extent that any attention was paid, it was typical. That the media’s military analysts failed to notice anything more than symbolism in the deep-sixing of PACOM shouldn’t be surprising, given all the attention being paid to other major international developments — the pyrotechnics of the Korean summit in Singapore, the insults traded at and after the G7 meeting in Canada, or the ominous gathering storm over Iran. Add to this the poor grasp so many journalists have of the nature of the U.S. military’s strategic thinking. Still, Mattis himself has not been shy about the geopolitical significance of linking the Indian and Pacific Oceans in such planning. In fact, it represents a fundamental shift in U.S. military thinking with potentially far-reaching consequences. 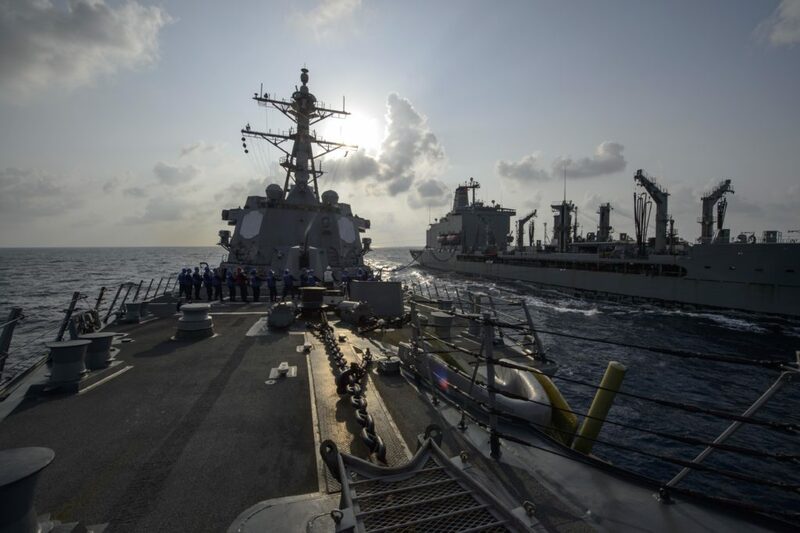 Consider the backdrop to the name change: in recent months, the United States has stepped up its naval patrols in waters adjacent to Chinese-occupied islands in the South China Sea — as has China — raising the prospect of future clashes between the warships of the two countries. Such moves have been accompanied by ever more threatening language from the Department of Defense, indicating an intent to do nothing less than engage China militarily if that country’s build-up in the region continues. “When it comes down to introducing what they have done in the South China Sea, there are consequences,” Mattis declared at the Shangri La Strategic Dialogue in Singapore on June 2, 2018. With that in mind, he soon announced that the Pentagon is planning to conduct “a steady drumbeat” of naval operations in waters abutting those Chinese-occupied islands, which should raise the heat between the two countries and could create the conditions for a miscalculation, a mistake, or even an accident at sea that might lead to far worse. In addition to its plans to heighten naval tensions in seas adjacent to China, the Pentagon has been laboring to strengthen its military ties with U.S.-friendly states on China’s perimeter, all clearly part of a long-term drive to — in Cold War fashion — “contain” Chinese power in Asia. On June 8, 2018, for example, the Defense Department launched Malabar 2018, a joint Pacific Ocean naval exercise involving forces from India, Japan and the United States. Incorporating once neutral India into America’s anti-Chinese “Pacific” alliance system in this and other ways has, in fact, become a major twenty-first-century goal of the Pentagon, posing a significant new threat to China. For decades, the principal objective of U.S. strategy in Asia had been to bolster key Pacific allies Japan, South Korea, Taiwan, and The Philippines, while containing Chinese power in adjacent waters, including the East and South China Seas. However, in recent times, China has sought to spread its influence into Southeast Asia and the Indian Ocean region, in part by extolling its staggeringly ambitious “One Belt, One Road” trade and infrastructure initiative for the Eurasian continent and Africa. That vast project is clearly meant both as a unique vehicle for cooperation and a way to tie much of Eurasia into a future China-centered economic and energy system. Threatened by visions of such a future, American strategists have moved ever more decisively to constrain Chinese outreach in those very areas. That, then, is the context for the sudden concerted drive by U.S. military strategists to link the Indian and Pacific Oceans and so encircle China with pro-American, anti-Chinese alliance systems. The name change on May 30 is a formal acknowledgement of an encirclement strategy that couldn’t, in the long run, be more dangerous. To grasp the ramifications of such moves, some background on the former PACOM might be useful. Originally known as the Far East Command, PACOM was established in 1947 and has been headquartered at U.S. bases near Honolulu, Hawaii, ever since. As now constituted, its “area of responsibility” encompasses a mind-boggling expanse. All of East, South and Southeast Asia, as well as Australia, New Zealand, and the waters of the Indian and Pacific Oceans — in other words, an area covering about 50 percent of the Earth’s surface and incorporating more than half of the global population. Though the Pentagon divides the whole planet like a giant pie into a set of “unified commands,” none of them is larger than the newly expansive, newly named Indo-Pacific Command, with its 375,000 military and civilian personnel. Before the Indian Ocean was explicitly incorporated into its fold, PACOM mainly focused on maintaining control of the western Pacific, especially in waters around a number of friendly island and peninsula states like Japan, South Korea, and The Philippines. Its force structure has largely been composed of air and naval squadrons, along with a large Marine Corps presence on the Japanese island of Okinawa. Its most powerful combat unit is the U.S. Pacific Fleet — like the area it now covers, the largest in the world. It’s made up of the 3rd and 7th Fleets, which together have approximately 200 ships and submarines, nearly 1,200 aircraft, and more than 130,000 sailors, pilots, Marines and civilians. On a day-to-day basis, until recently, the biggest worry confronting the command was the possibility of a conflict with nuclear-armed North Korea. During the late fall of 2017 and the winter of 2018, PACOM engaged in a continuing series of exercises designed to test its forces’ ability to overcome North Korean defenses and destroy its major military assets, including nuclear and missile facilities. These were undoubtedly intended, above all, as a warning to North Korean leader Kim Jong Un about what he could expect if he continued down the path of endless provocative missile and nuclear tests. It seems that, at least for the time being, Trump has suspended such drills as a result of his summit meeting with Kim. North Korea aside, the principal preoccupation of PACOM commanders has long been the rising power of China and how to contain it. This was evident at the May 30 ceremony in Hawaii at which Mattis announced that expansive name change and presided over a change-of-command ceremony, in which outgoing commander, Admiral Harry Harris Jr., was replaced by Adm. Phil Davidson. Given the naval-centric nature of its mission, the command is almost invariably headed by an admiral. While avoiding any direct mention of China in his opening remarks, Mattis left not a smidgeon of uncertainty that the command’s new name was a challenge and a call for the future mobilization of regional opposition across a vast stretch of the planet to China’s dreams and desires. Other nations welcome U.S. support, he insisted, as they prefer an environment of “free, fair, and reciprocal trade not bound by any nation’s predatory economics or threat of coercion, for the Indo-Pacific has many belts and many roads.” No one could mistake the meaning of that. Yes, he admitted, it was still possible to cooperate with the Chinese on limited issues, but we should “stand ready to confront them when we must.” On May 18, 2018, Harris was nominated by President Trump as the future U.S. ambassador to South Korea, which will place a former military man at the U.S. embassy in Seoul. Harris’s successor Davidson seems, if anything, even more determined to put confronting China atop the command’s agenda. During his confirmation hearing before the Senate Armed Services Committee on April 17, 2018, he repeatedly highlighted the threat posed by Chinese military activities in the South China Sea and promised to resist them vigorously. Is that, then, what Davidson sees in our future? War with China in those waters? His testimony made it crystal clear that his primary objective as head of the Indo-Pacific Command will be nothing less than training and equipping the forces under him for just such a future war, while enlisting the militaries of as many allies as possible in the Pentagon’s campaign to encircle that country. Davidson’s first priority is to procure advanced weaponry and integrate it into the command’s force structure, ensuring that American combatants will always enjoy a technological advantage over their Chinese counterparts in any future confrontation. Almost as important, he, like his predecessors, seeks to bolster America’s military ties with other members of the contain-China club. This is where India comes in. Like the United States, its leadership is deeply concerned with China’s expanding presence in the Indian Ocean region, including the opening of a future port/naval base in Gwadar, Pakistan, and another potential one on the island of Sri Lanka, both in the Indian Ocean. Not surprisingly, given the periodic clashes between Chinese and Indian forces along their joint Himalayan borderlands and the permanent deployment of Chinese warships in the Indian Ocean, India’s prime minister Narendra Modi has shown himself to be increasingly disposed to join Washington in military arrangements aimed at limiting China’s geopolitical reach. The way the name change at PACOM was covered in the United States, you would think it reflected, at most, a benign wish for greater economic connections between the Indian and Pacific Ocean regions, as well, perhaps, as a nod to America’s growing relationship with India. Nowhere was there any hint that what might lie behind it was a hostile and potentially threatening new approach to China — or that it could conceivably be perceived that way in Beijing. But there can be no doubt that the Chinese view such moves, including recent provocative naval operations in the disputed Paracel Islands of the South China Sea, as significant perils. When, in late May 2018, the Pentagon dispatched two warships — USS Higgins, a destroyer, and USS Antietam, a cruiser — into the waters near one of those newly fortified islands, the Chinese responded by sending in some of their own warships while issuing a statement condemning the provocative American naval patrols. The U.S. action, said a Chinese military spokesperson, “seriously violated China’s sovereignty [and] undermined strategic mutual trust.” Described by the Pentagon as “freedom of navigation operation,” such patrols are set to be increased at the behest of Mattis. Of course, the Chinese are hardly blameless in the escalating tensions in the region. They have continued to militarize South China Sea islands whose ownership is in dispute, despite a promise that Chinese president Xi Jinping made to Pres. Barack Obama in 2015 not to do so. Some of those islands in the Spratly and Paracel archipelagos are also claimed by Vietnam, The Philippines, and other countries in the area and have been the subject of intensifying, often bitter disagreements among them about where rightful ownership really lies. Beijing has simply claimed sovereignty over all of them and refuses to compromise on the issue. By fortifying them — which American military commanders see as a latent military threat to U.S. forces in the region — Beijing has provoked a particularly fierce U.S. reaction, though these are obviously waters relatively close to China, but many thousands of miles from the continental United States. From Beijing, the strategic outlook articulated by Mattis, as well as Harris and Davidson, is clearly viewed — and not without reason — as threatening and as evidence of Washington’s master plan to surround China, confine it, and prevent it from ever achieving the regional dominance its leaders believe is its due as the rising great power on the planet. To the Chinese leadership, changing PACOM’s name to the Indo-Pacific Command will just be another signal of Washington’s determination to extend its unprecedented military presence westward from the Pacific around Southeast Asia into the Indian Ocean and so further restrain the attainment of what it sees as China’s legitimate destiny. However Chinese leaders end up responding to such strategic moves, one thing is certain. They will not view them with indifference. On the contrary, as challenged great powers have always done, they will undoubtedly seek ways to counter America’s containment strategy by whatever means are at hand. These may not initially be overtly military or even obvious, but in the long run they will certainly be vigorous and persistent. They will include efforts to compete with Washington in pursuit of Asian allies — as seen in Beijing’s fervent courtship of Pres. Rodrigo Duterte of the Philippines — and to secure new basing arrangements abroad, possibly under the pretext, as in Pakistan and Sri Lanka, of establishing commercial shipping terminals. All of this will only add new tensions to an already anxiety-inducing relationship with the United States. As ever more warships from both countries patrol the region, the likelihood that accidents will occur, mistakes will be made, and future military clashes will result can only increase. With the possibility of war with North Korea fading in the wake of the recent Singapore summit, one thing is guaranteed. The new U.S. Indo-Pacific Command will only devote itself ever more fervently to what is already its one overriding priority: preparing for a conflict with China. 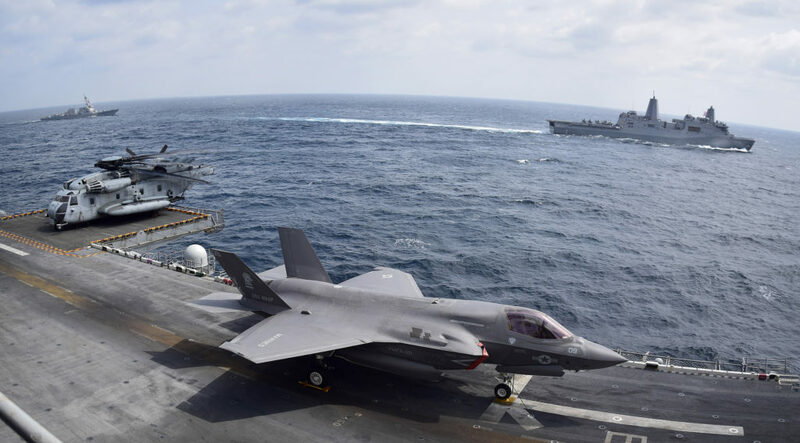 Its commanders insist that they do not seek such a war, and believe that their preparations — by demonstrating America’s strength and resolve — will deter the Chinese from ever challenging American supremacy. That, however, is a fantasy. In reality, a strategy that calls for a “steady drumbeat” of naval operations aimed at intimidating China in waters near that country will create ever more possibilities, however unintended, of sparking the very conflagration that it is, at least theoretically, designed to prevent. Right now, a Sino-American war sounds like the plotline of some half-baked dystopian novel. Unfortunately, given the direction in which both countries — and their militaries — are heading, it could, in the relatively near future, become a grim reality.